Yagi antenna Basic form of antenna, used in radio telescopes and for work on the ionosphere. It consists of several parallel elements mounted on a straight member; it is the familiar form of a television aerial. A Yagi antenna often forms the basis of cheap arrays used for aperture synthesis. It was developed by the Japanese engineer Hietsugu Yagi (1886-1976). year Time taken for the Earth to complete a single revolution around the Sun. Several different types of year are defined, with differing lengths, according to which point of reference is chosen. An anomalistic year is one revolution relative to perihelion; it is equivalent to 365.25964 mean solar days. An eclipse year is one revolution relative to the same node of the Moon's orbit; it is equivalent to 346.62003 mean solar days. Nineteen eclipse years are 6585.78 days, almost exactly the same as a saros. A sidereal year is one revolution relative to the fixed stars; it equivalent to 365.25636 mean solar days. A tropical year or solar year is one revolution relative to the equinoxes; it equivalent to 365.24219 mean solar days. For convenience, the civil or calendar year is set at a whole number of days, usually 365 but 366 in a leap year. Yerkes Observatory Observatory of the University of Chicago, located at an elevation of 334 m (1050 ft) at Williams Bay, Wisconsin, near Chicago. It is famous for its 1.02-m (40-in.) refracting telescope, built in 1897 with optics figured by alvan clark & sons and a mounting constructed by the warner & swasey company, and still the largest refractor in the world. The observatory owes its foundation to George Ellery hale, who persuaded the streetcar magnate Charles Tyson Yerkes (1837-1905) to finance the great telescope. The observatory also has 1.02-m (40-in.) and 0.6-m (24-in) reflectors and a number of smaller instruments. Gerard kuiper used the 40-inch to discover miranda in 1948 and nereid the year after. Today, though light pollution limits observational astronomy from the William Bay site, Yerkes is still a major research institution and its astronomers use such facilities as the Astrophysics Research Consortium's 3.5-m (138-in.) telescope at Apache Point, New Mexico, the hubble space telescope and the telescopes of the w.m. keck observatory. 'Y-feature' Characteristic atmospheric feature of venus. Although this planet is virtually featureless in visible light, ultraviolet photographs reveal a banded structure that resolves into a characteristic shape, a horizontal letter Y. This feature rotates around the planet in a period of only four to five days, implying wind speeds of 100 m/s (330 ft/s) in the upper atmosphere. The solid surface rotates at only about 4 m/s (13 ft/s). Yohkoh (Sunbeam) Solar X-ray satellite, a collaboration between the Japanese Institute of Space and Astronautical Science (ISAS), NASA and the UK. Launched from the Kagoshima Space Centre in 1991 August, the spacecraft has observed the solar atmosphere continuously for more than an entire cycle of solar activity. Yohkoh This Yohkoh image of the active Sun at X-ray wavelengths shows hot coronal plasma in magnetic loops above active regions. Cooler, dark regions above the poles are described as coronal holes; these extend to lower solar latitudes at sunspot minimum. Yohkoh's main scientific objective is to observe the energetic phenomena taking place on the Sun, especially X-ray and gamma-ray emissions from solar flares. It carries four instruments that detect these energetic emissions - two spectrometers, a soft X-ray telescope (SXT) and a hard X-ray telescope (HXT). The observations of spectral lines provide information about the temperature and density of the hot plasma in the Sun's atmosphere, and about motions of the plasma along the line of sight. The SXT images X-rays in the range 0.25—1.0 keV and can resolve features down to 2".5 in size. Flare images can be obtained every 2 seconds. Smaller images with a single filter can be obtained as frequently as once every 0.5 seconds. The HXT observes hard X-rays in four energy bands and can resolve structures with angular sizes of about 5". These images can also be obtained once every 0.5 seconds. 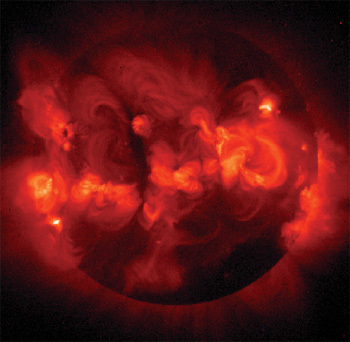 Yohkoh played an important role in improving understanding of processes in the solar atmosphere. Of particular interest were the origin of solar flares, the link between such flares and coronal mass ejections, studies of coronal holes and the evolution of magnetic loops. The Yohkoh spacecraft is in a slightly elliptical low Earth orbit, with an altitude ranging from approximately 570 to 730 km (355 to 455 mi); 65 to 75 minutes of each 90-minute orbit are spent in sunlight. Young, Charles Augustus (1834-1908) American solar astronomer at Dartmouth (1866-77) and Princeton (1877-1905) who made early spectroscopic studies of the solar corona, proving its gaseous nature. He obtained the first flash spectra of the solar chromosphere during a total eclipse in 1870 and compiled a catalogue of bright solar spectral lines to measure the Sun's rotational velocity. Young obtained the first successful photographs of solar prominences in visible light.